Sip or Squirt is in view ahead, slightly to the left. It’s in front of the giant, black Tactile Dome. 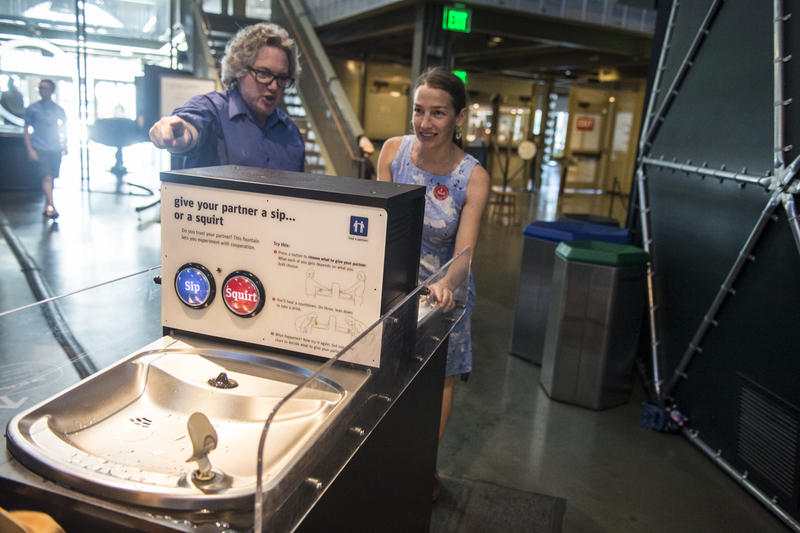 This two-person drinking fountain was inspired by the prisoner's dilemma, a famous paradox of game theory: Do you choose to sacrifice your companion—and to some degree yourself— ather than risk being a trusting chump? The concept applies more broadly though, to economics, politics, environmental issues, and even sports. In professional cycling, for example, many athletes engage in doping out of fear of being the only person not doping. Here, some people try to protect themselves from getting squirted, others don't. How did you decide whether to give your partner a sip or a squirt? Freeloader is in view straight ahead, slightly on the right about 12 feet away. Are you playing for the team—or yourself? In this game, you must decide whether to take a free ride or pony up to keep the game going. 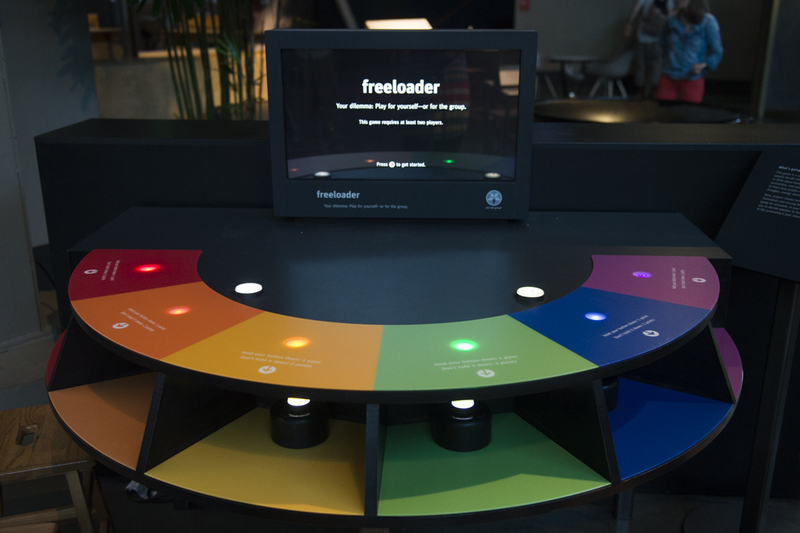 Freeloader is inspired by the volunteer’s dilemma: If everyone else is helping out, do you need to bother? If someone else will do the hard work, why not sit back and rest? The tendency to freeload is not just a human one. Examples of freeloading abound in the animal kingdom, from ants to elephants. But altruism, too, is a natural tendency in many species—including our own. You may have noticed that Freeloader never tells you the object of the game—to score the most points or to have the longest game. What did “winning” mean to you? Turn left until you see Text Fish on a wall about 20 feet away in the direction of the Bay (depending on which seat you’re at, you will turn between 90 and 270 degrees). Should you show restraint or get while the getting is good? You’re tasked with managing an ocean ecosystem. 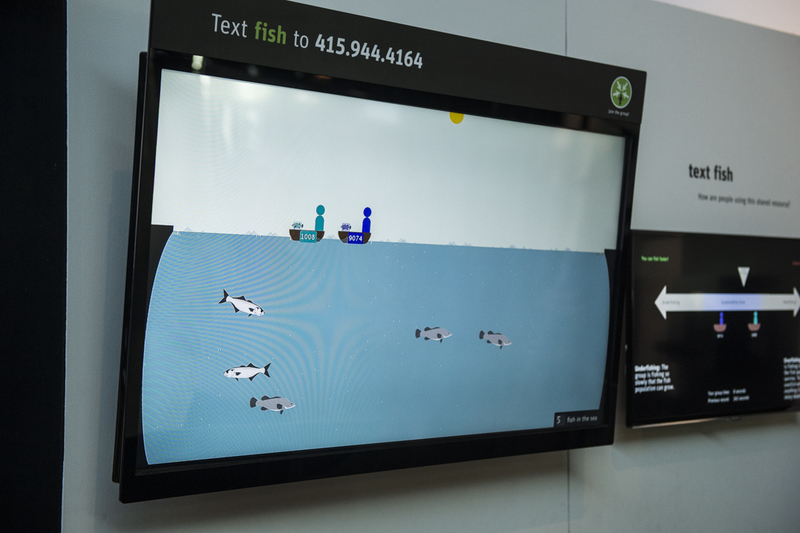 Will you help maintain the fish population or just catch as much as you can? Here you get a clear picture of a phenomenon known as the tragedy of the commons—the tendency of individuals to pursue their own interest and overexploit shared resources—with the end result that the resource itself is destroyed for all. The term was coined in reference to the grazing of cattle on common land, but has since been applied to all kinds of unregulated resources, including fish stocks, oceans, the atmosphere, public parks, shared refrigerators, and even satellite orbits. Can you think of any examples from your own life where you took a short-term gain and lost a bigger, longer-term reward? Turn around and walk toward the Cinema on the far side of the gallery. Once you reach the Cinema, Team Snake is to your left. Team Snake is a new take on a classic video game—Centipede—in which survival requires a group effort. Since each player controls only part of the action, only a well-coordinated group can keep the creature alive and growing. As you rapidly discover here—if you didn’t already know it—is that cooperation is quite tricky in practice: It requires not just willingness to participate, but also clear communication, diplomacy, and patience, patience, patience. It’s fun to play anthropologist here and watch other people: What strategies are they using? Is there a “boss”? How well are they working together? Unlike the other exhibits on this tour, Team Snake forces you to cooperate. 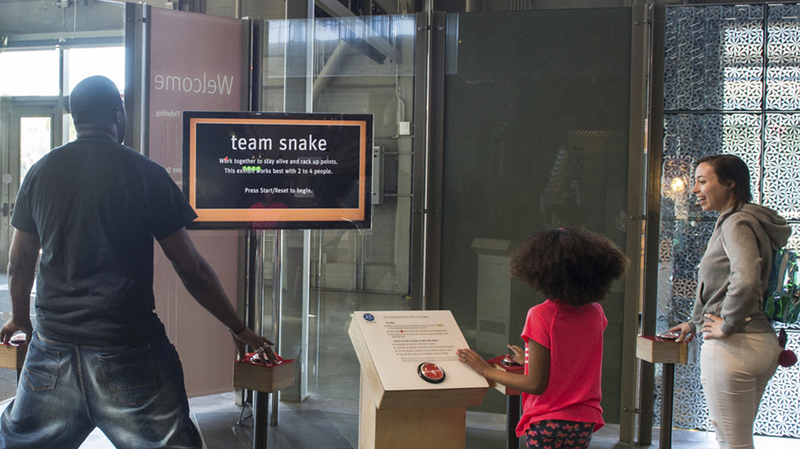 Do you think you might have made different choices at the previous exhibits if you’d played Team Snake first?